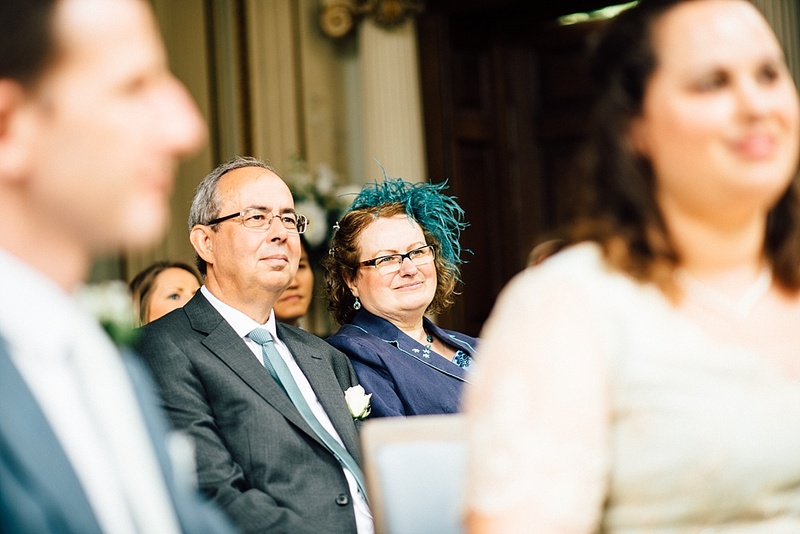 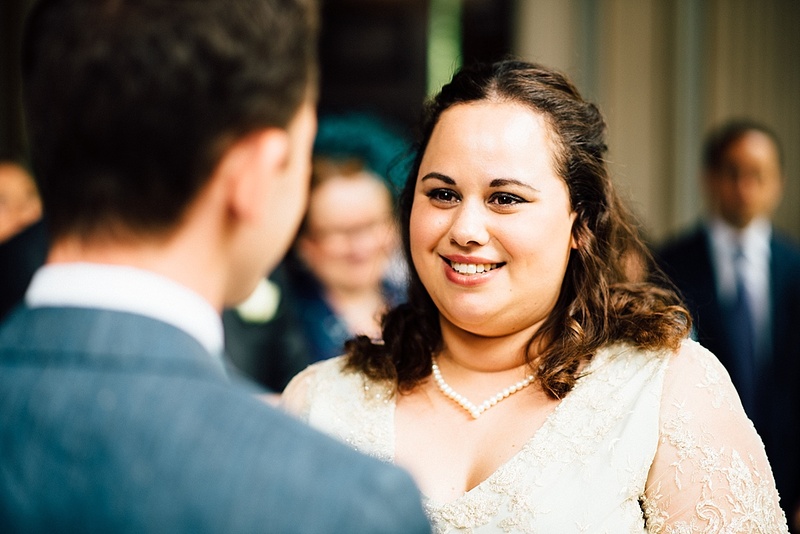 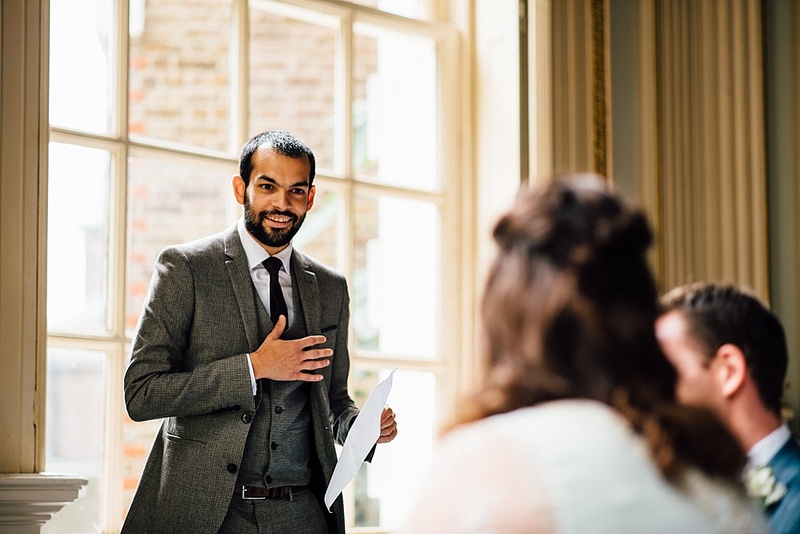 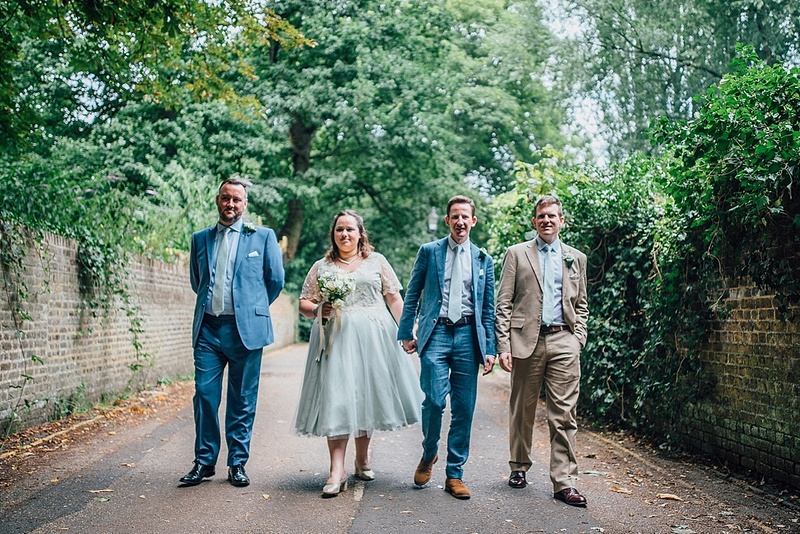 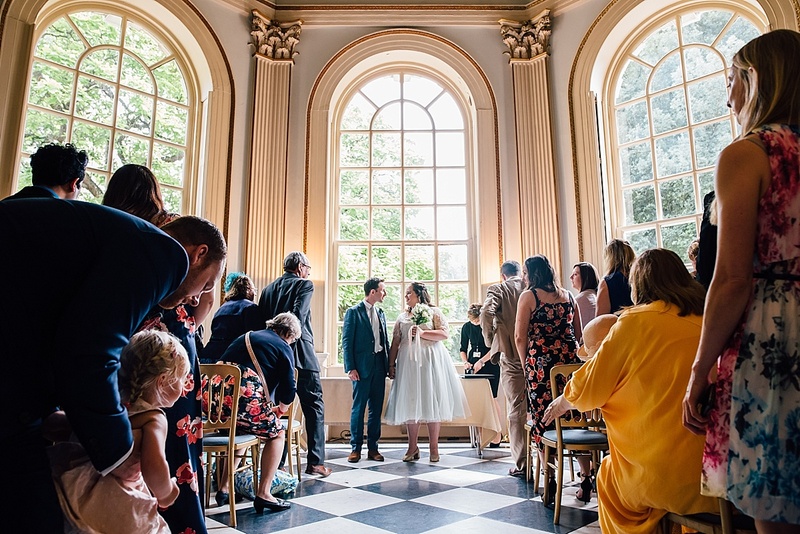 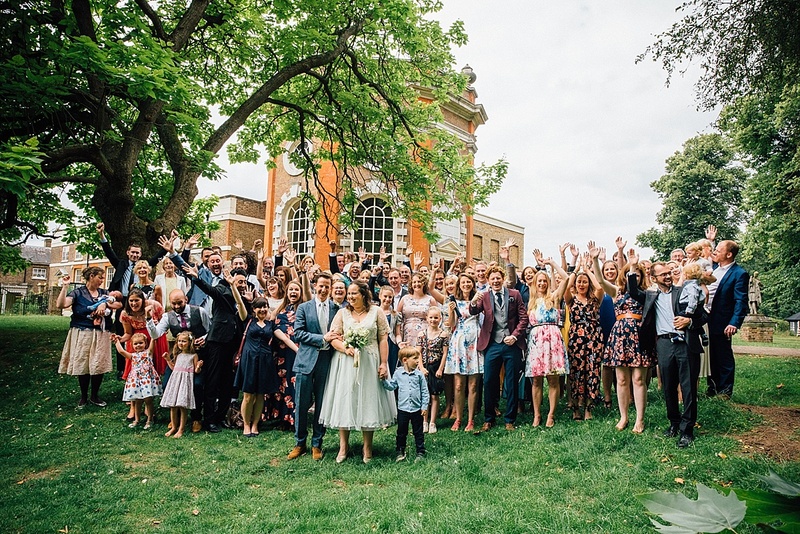 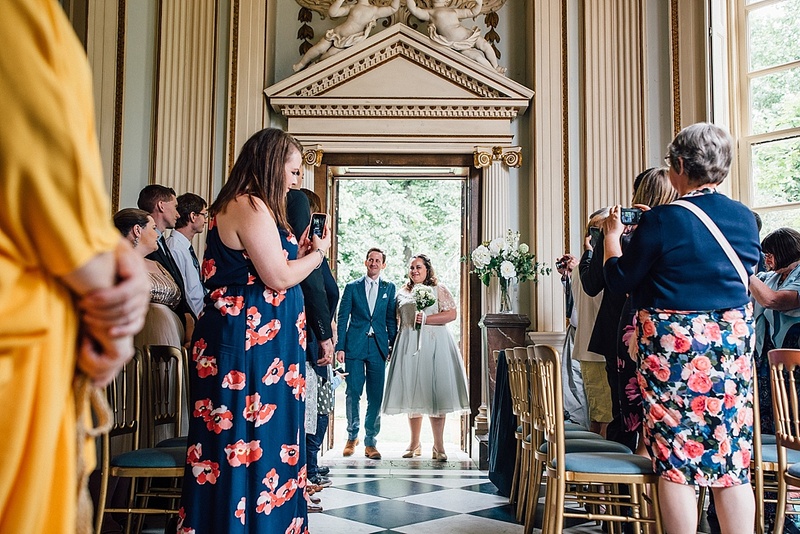 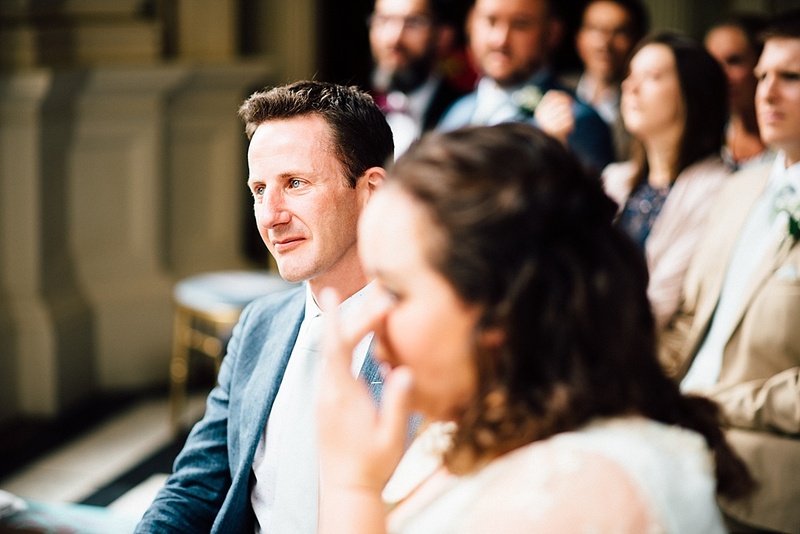 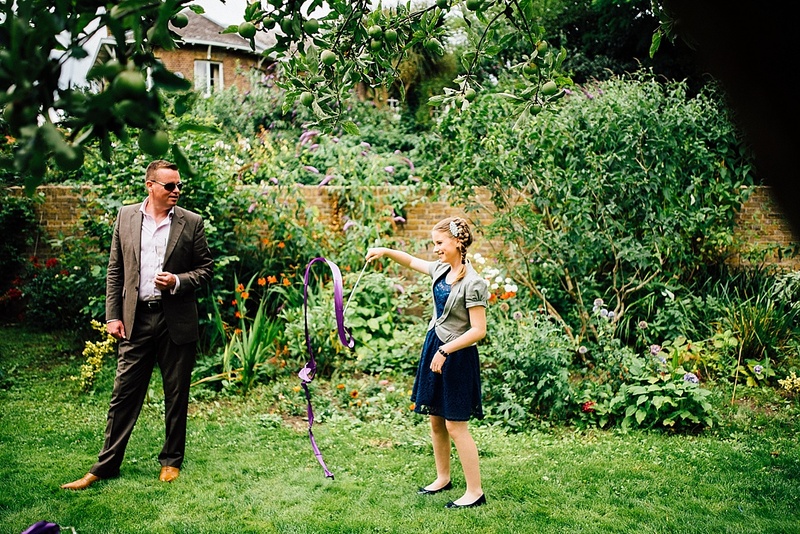 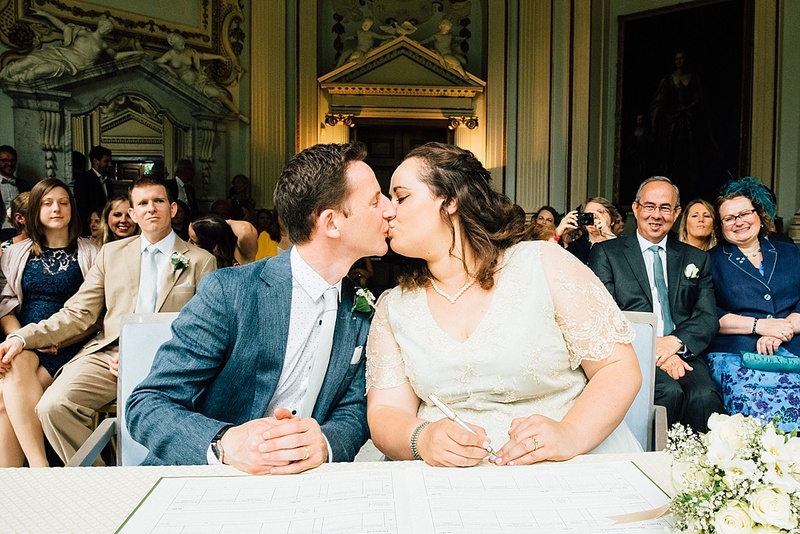 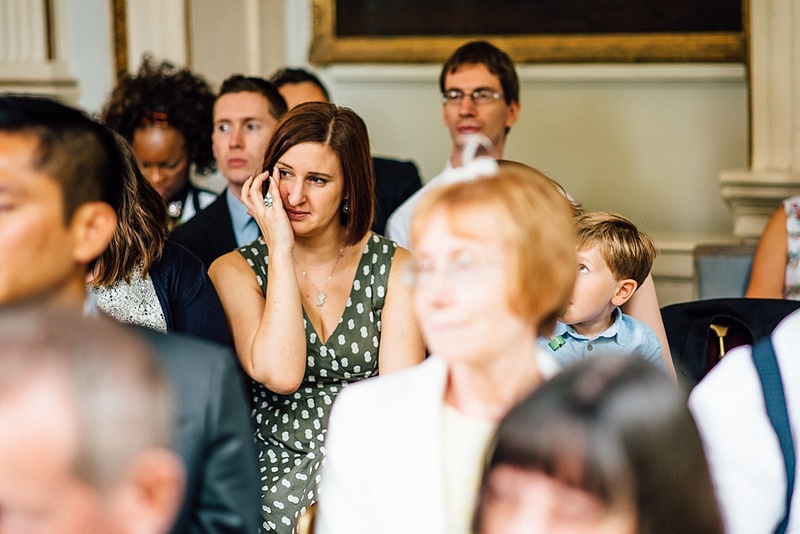 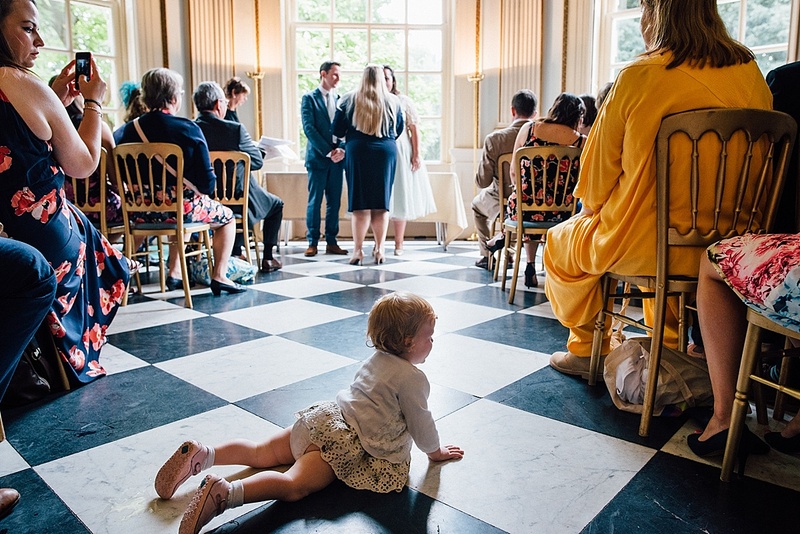 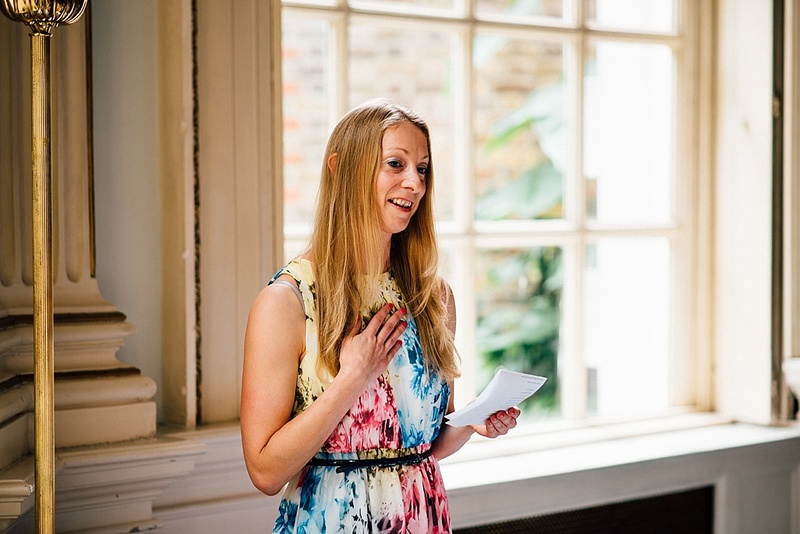 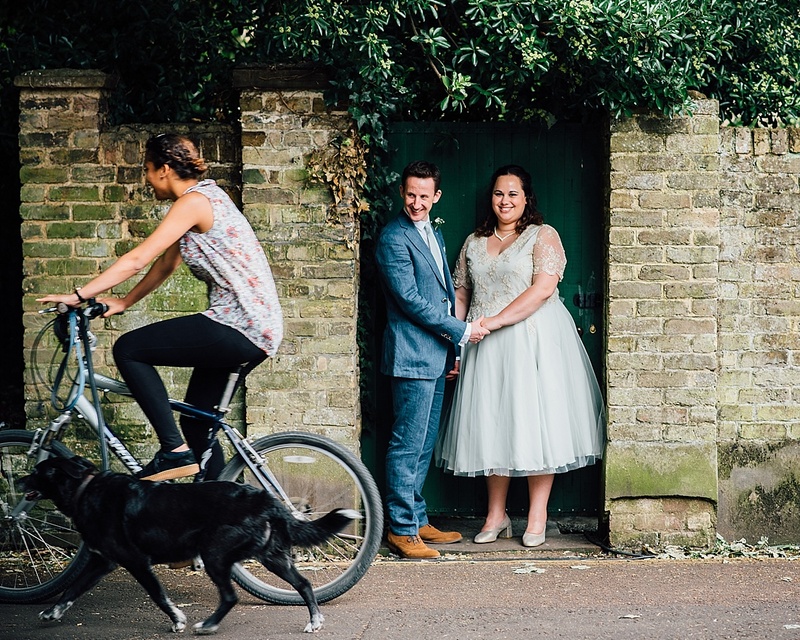 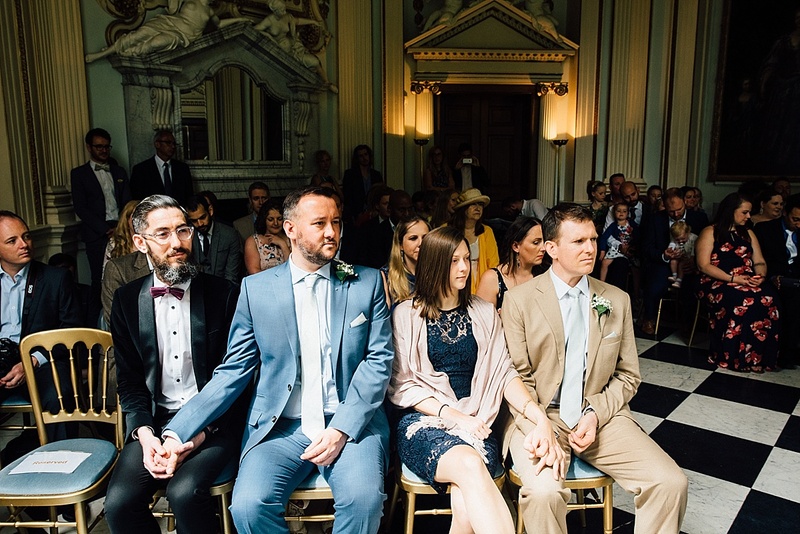 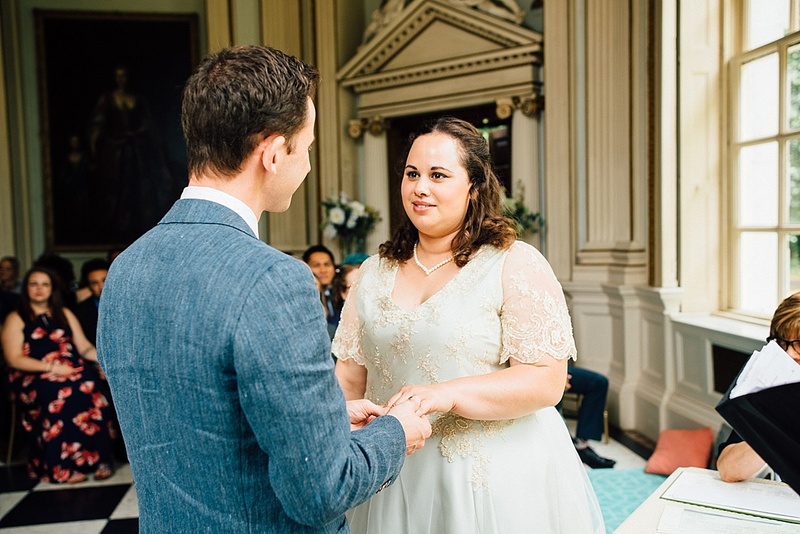 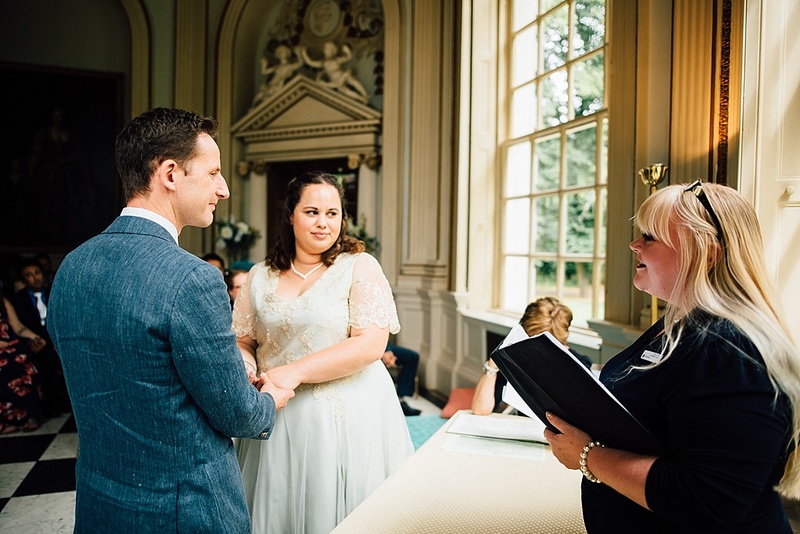 Hilary and Richard got married at Orleans House Gallery in Twickenham back in July 2016. 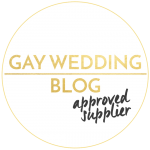 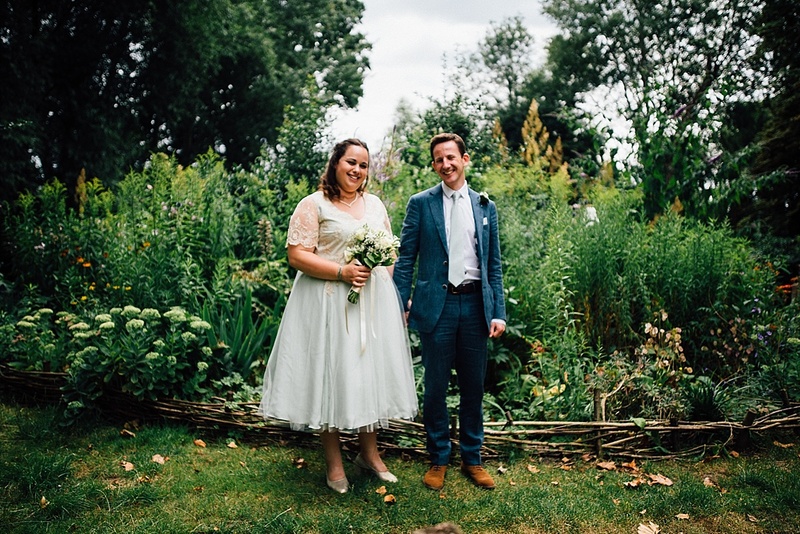 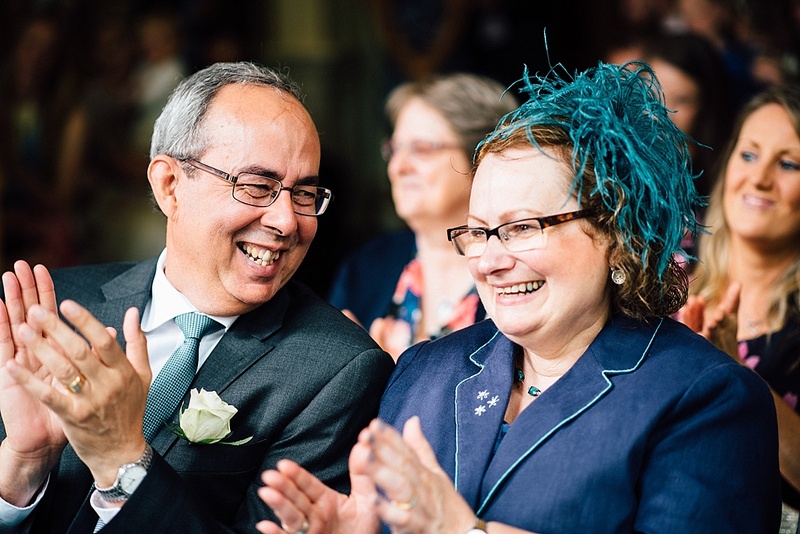 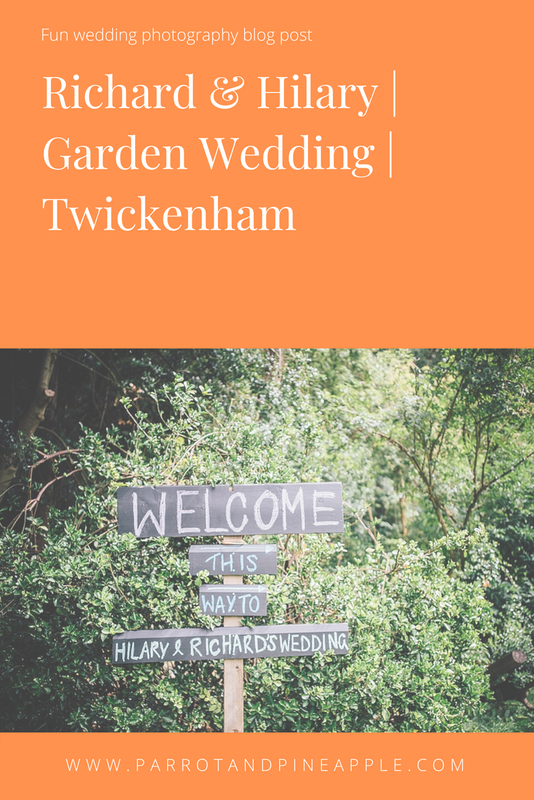 When we met to discuss and plan their garden wedding, Hilary and Richard told me that they were most looking forward to having an informal wedding and celebrating with their family and friends. 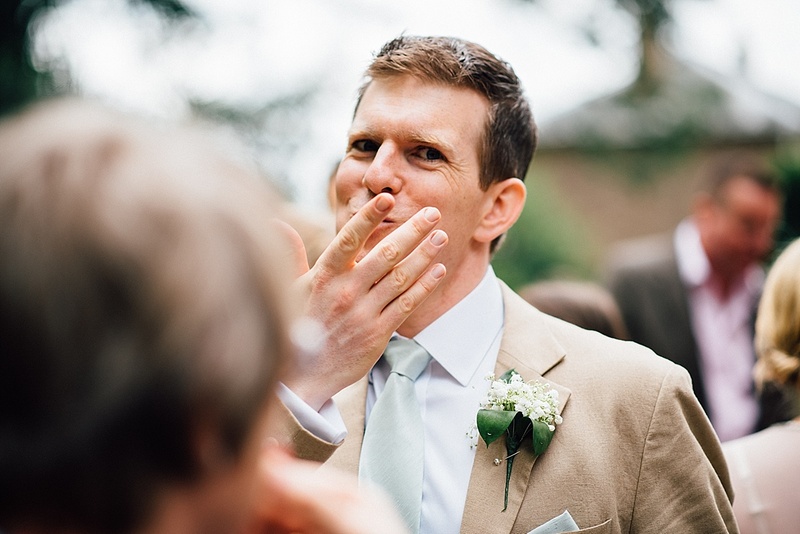 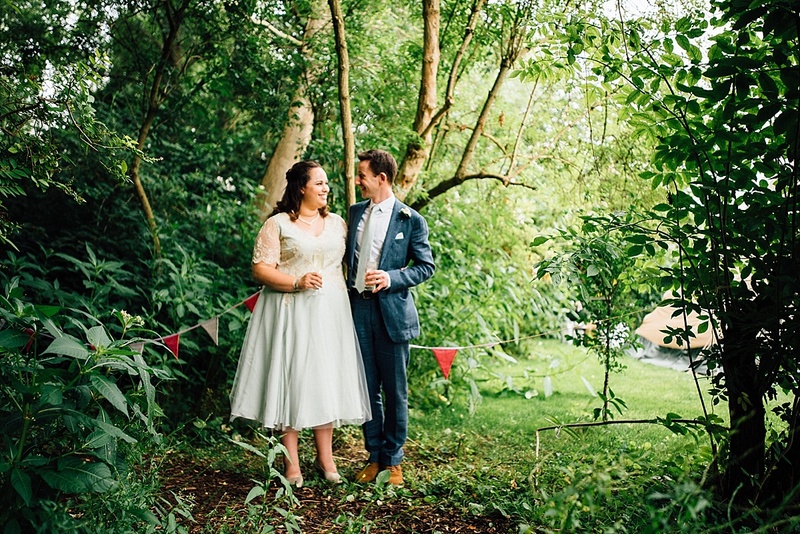 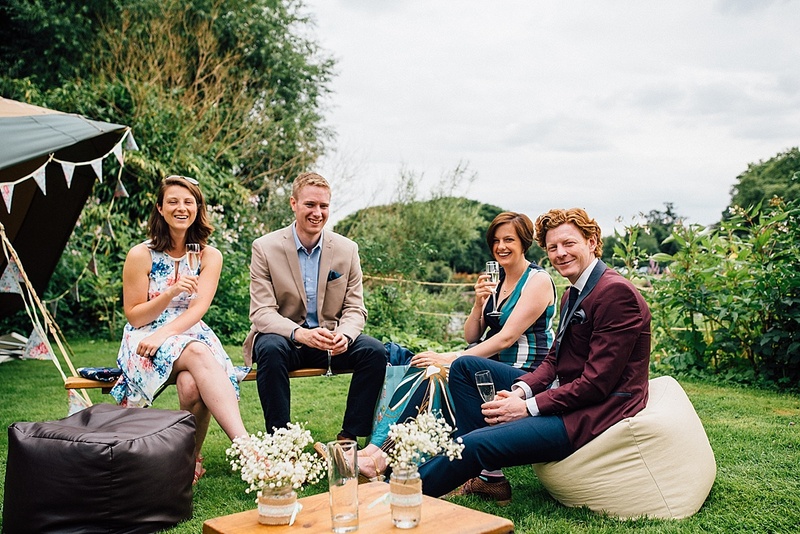 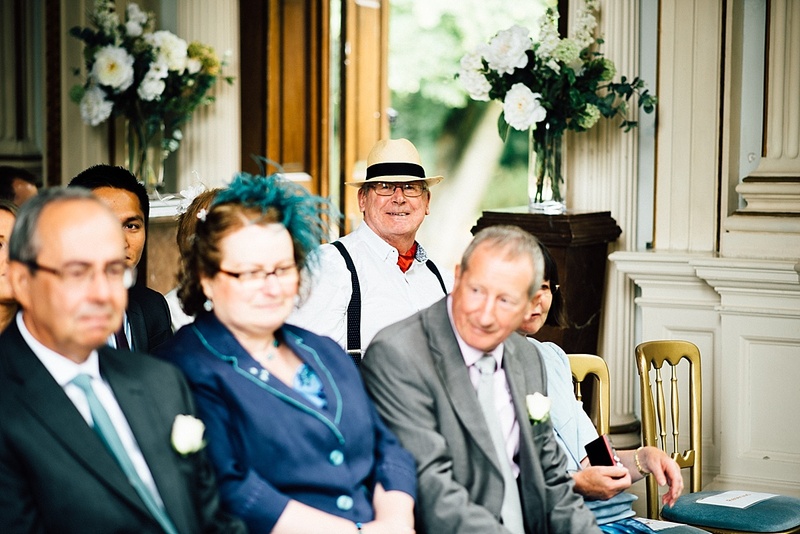 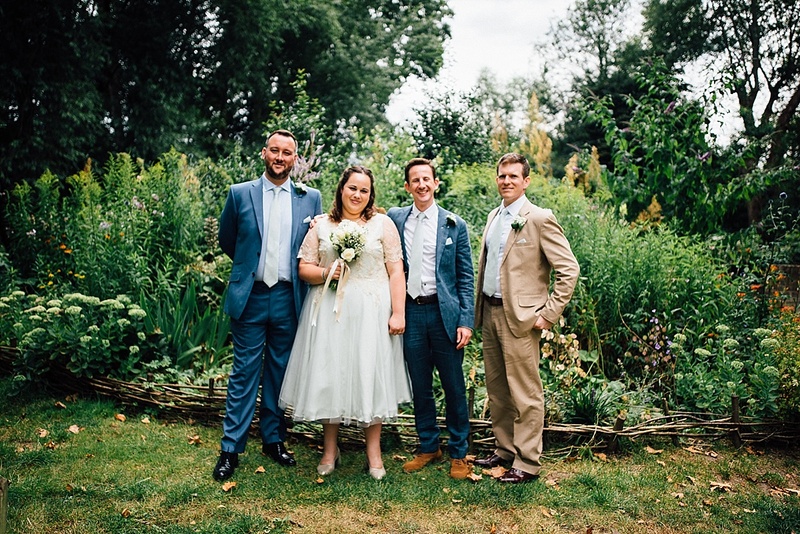 The day started with a casual and relaxed vibe that continued right through to the garden wedding party. 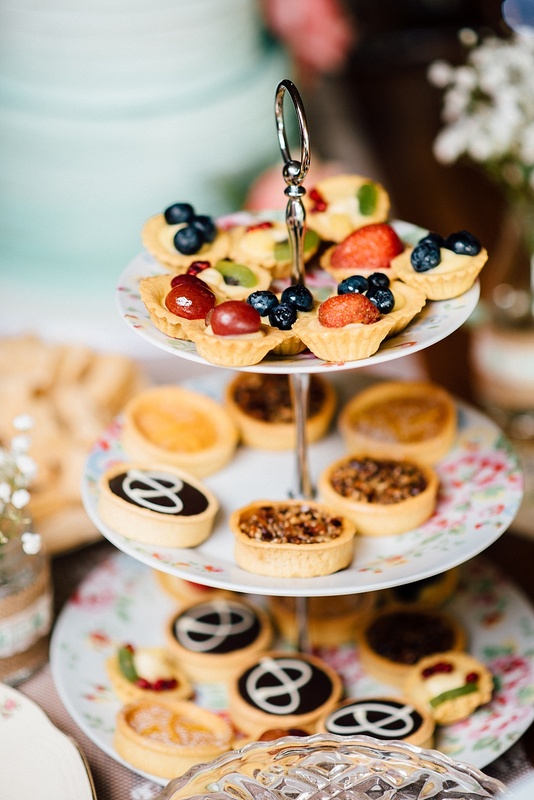 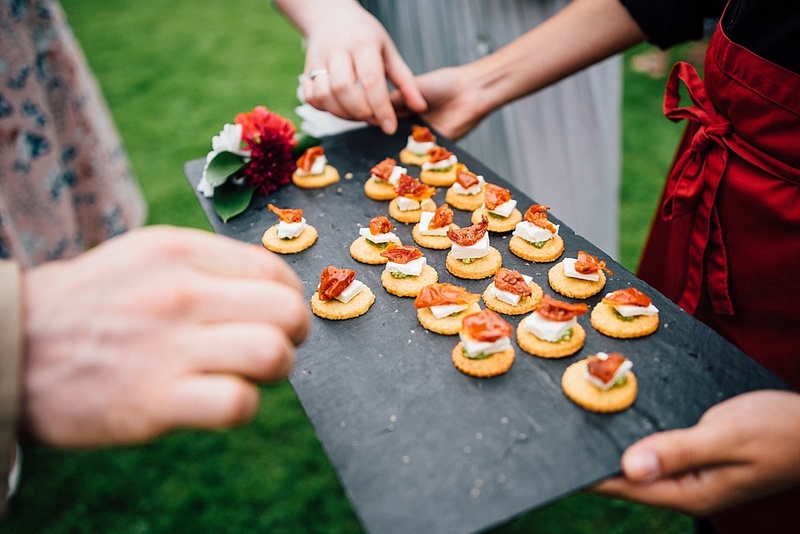 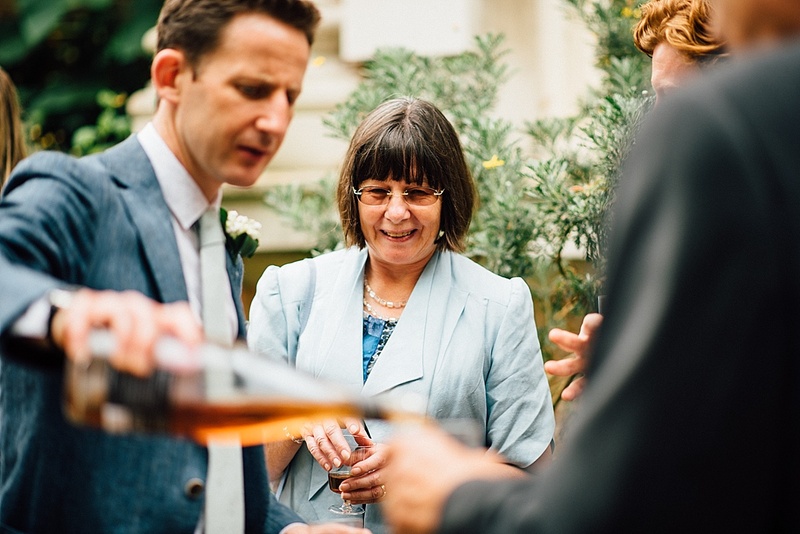 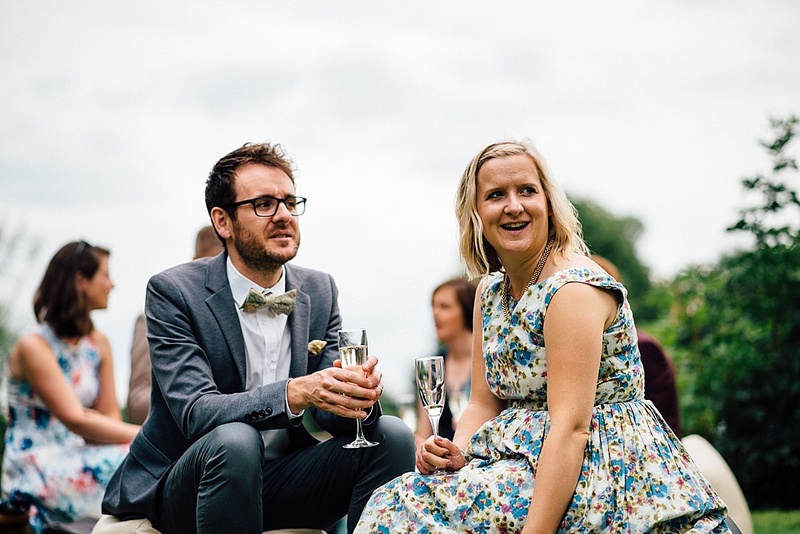 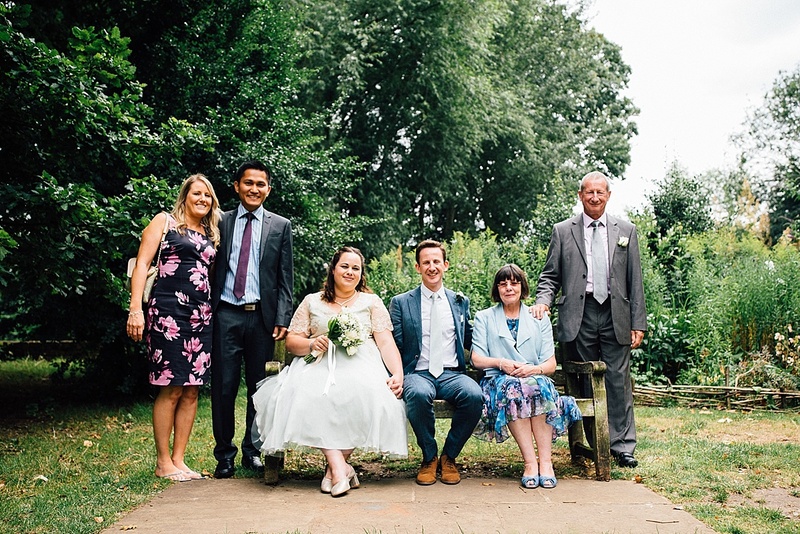 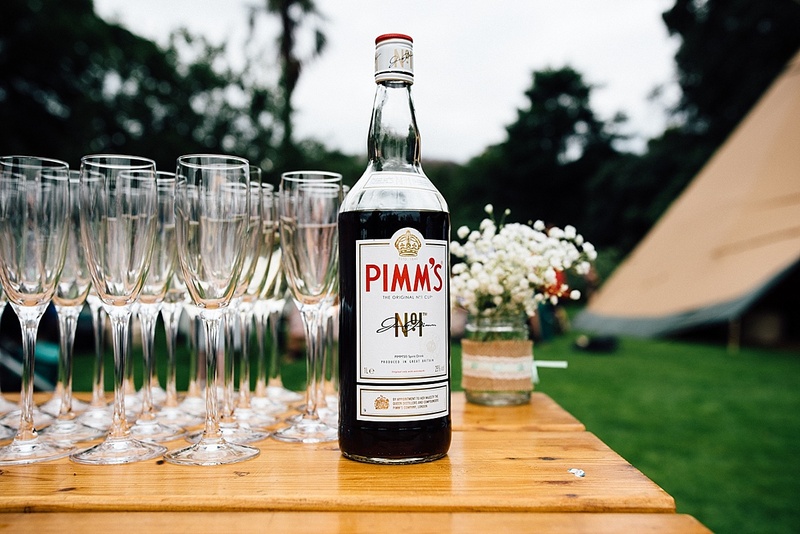 The couple wanted to break with tradition, so they arrived at the venue together to welcome their guests with cider and mini scones with jam and cream – a nod to the bride’s family roots in Devon. 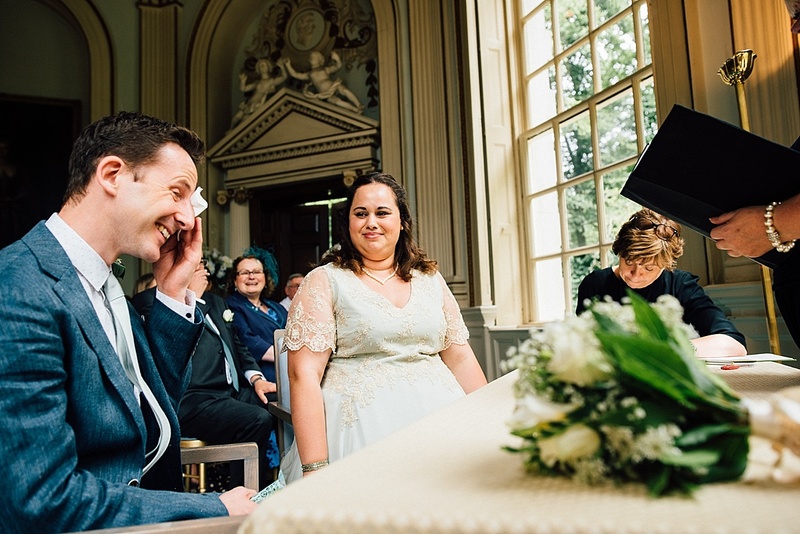 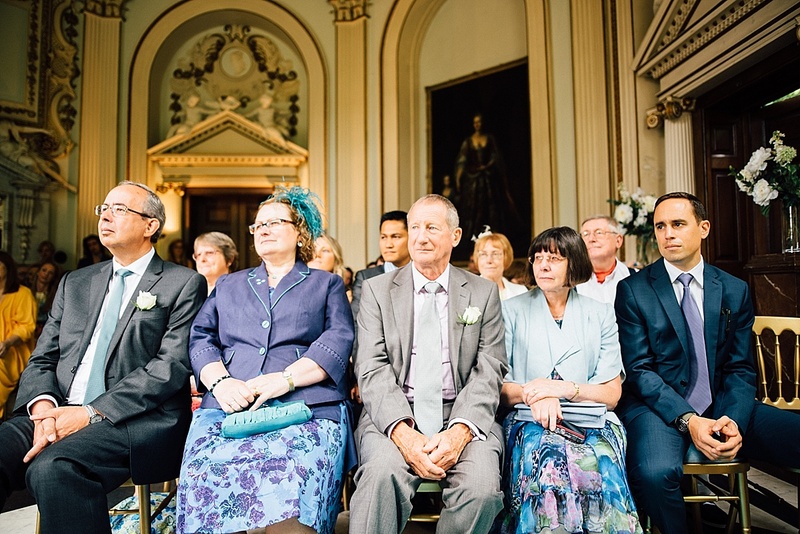 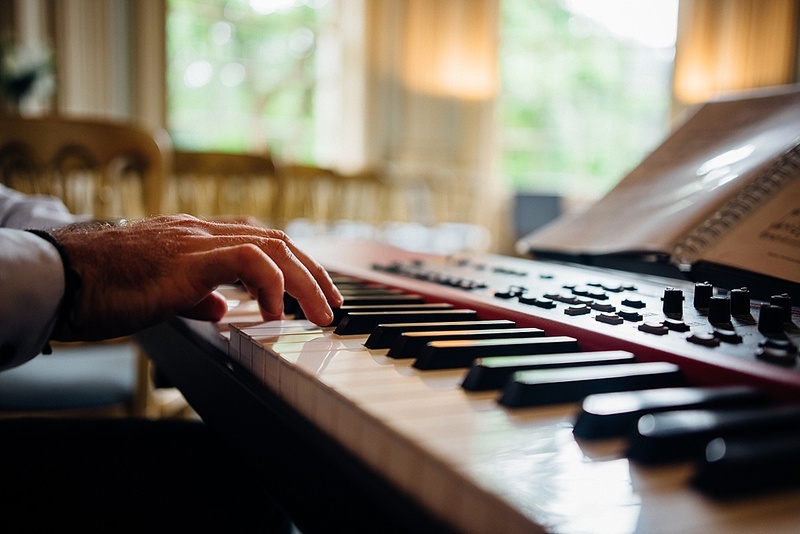 The guests entered the ceremony room to the sound of a pianist playing songs from the couple’s favourite show tunes. 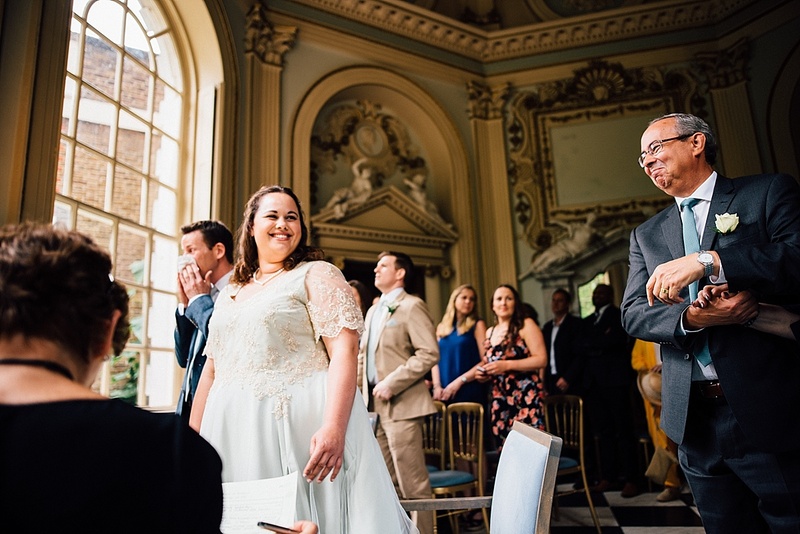 Once everyone was seated, Hilary and Richard walked down the aisle together. 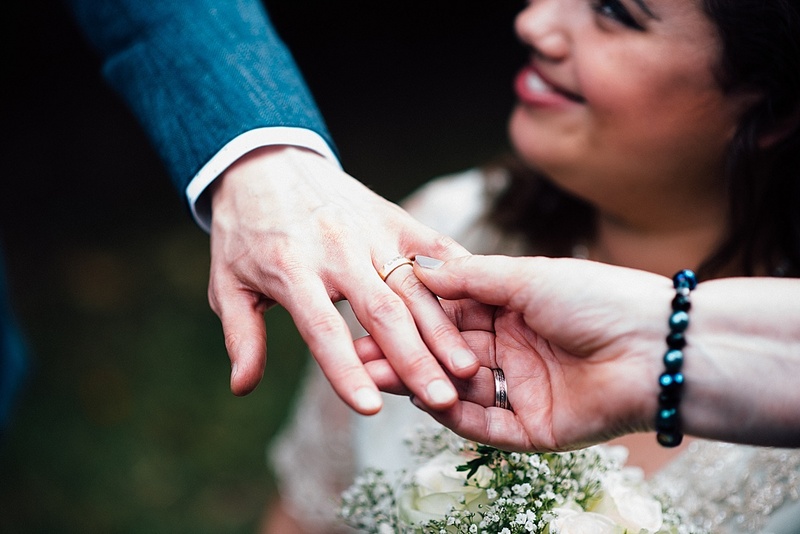 The ceremony was simple, elegant and meaningful with two readings and the traditional exchange of rings. 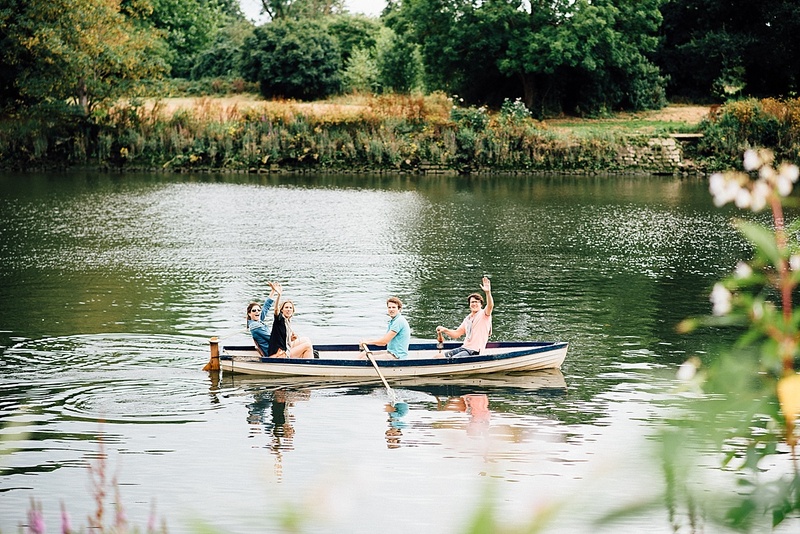 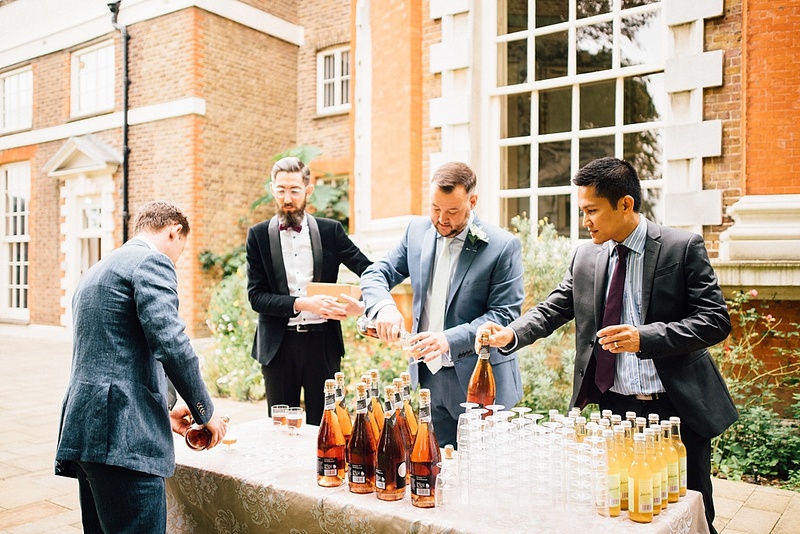 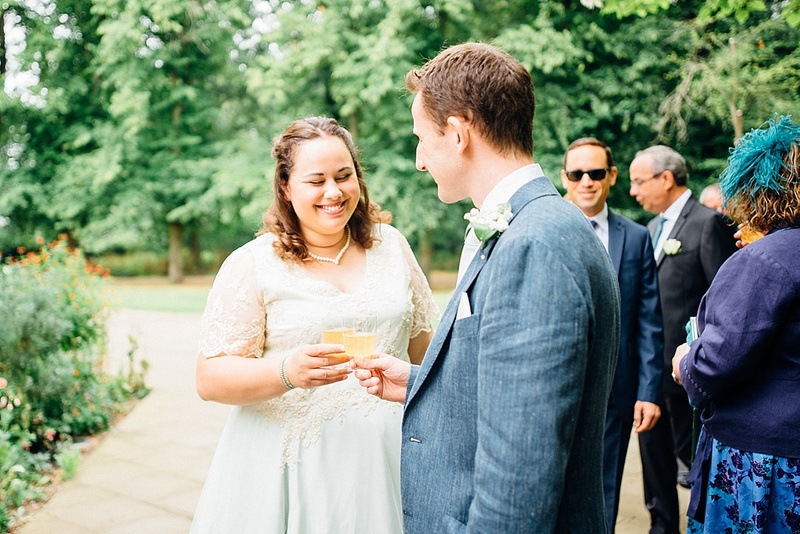 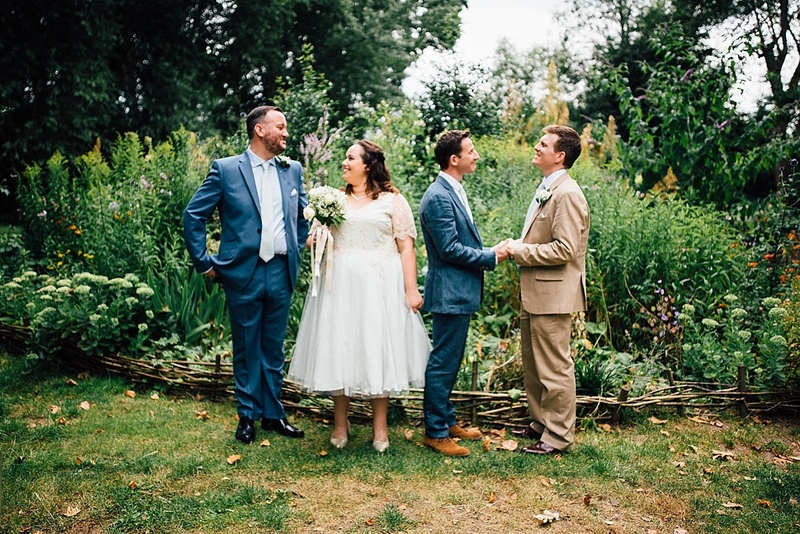 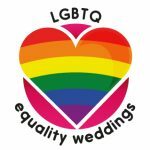 Once outside, the wedding party walked to the reception held at The Secret River Garden; a secret oasis hidden behind a high wall and opening out on to the banks of the River Thames. 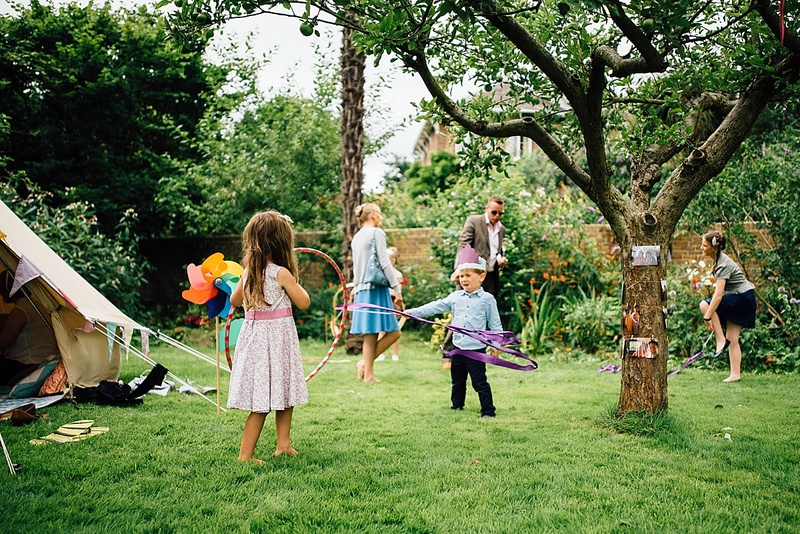 The garden was in full summer bloom with a tiny woodland and lush green lawn. 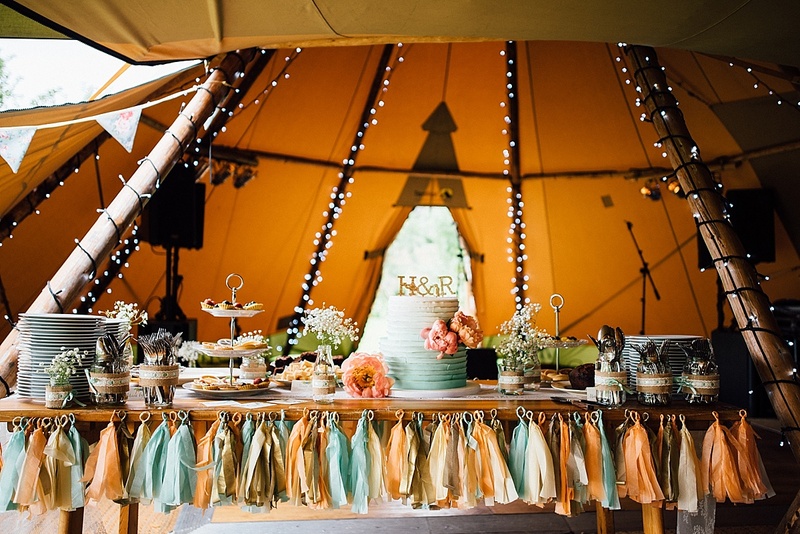 Richard and Hilary took no chances with the weather and had hired a really fab tipi to host their sit down meal and dance floor. 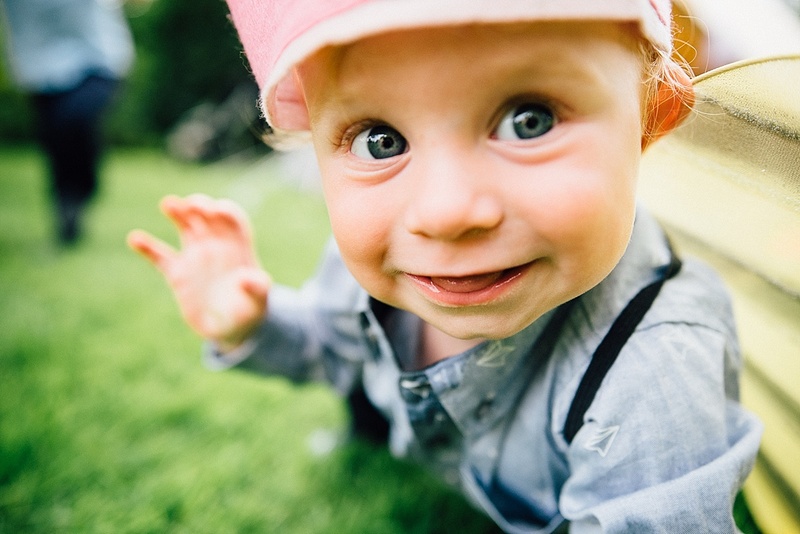 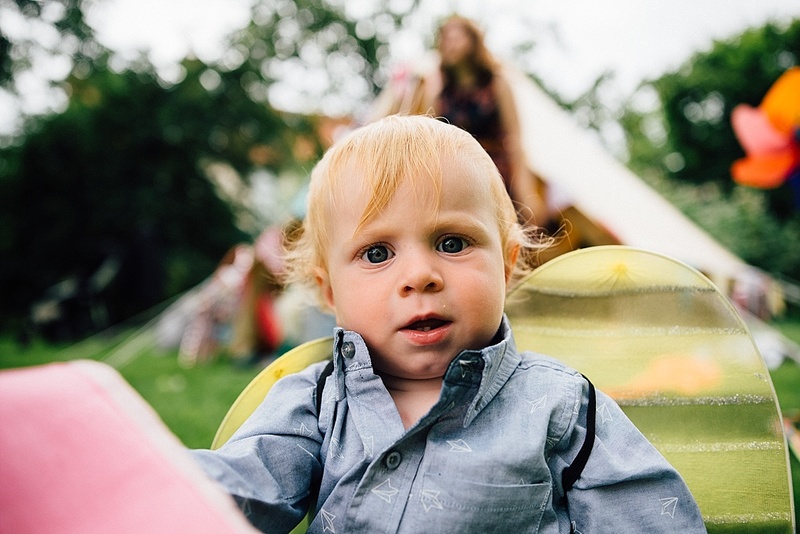 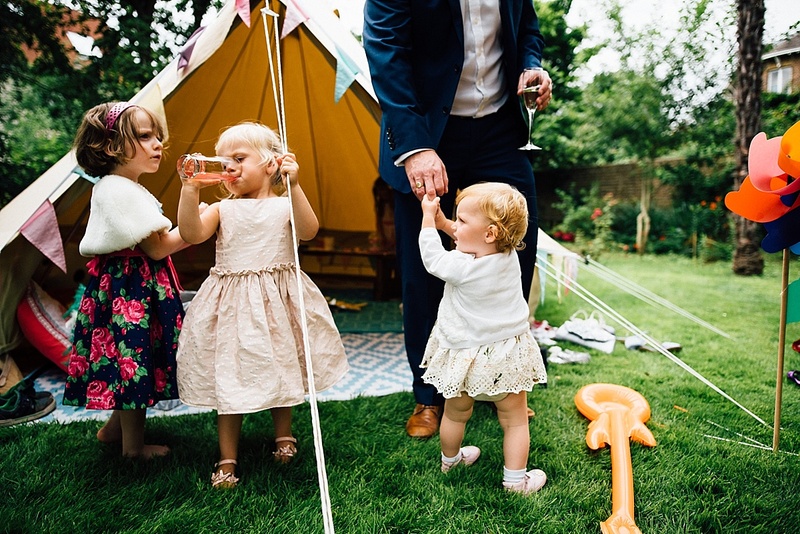 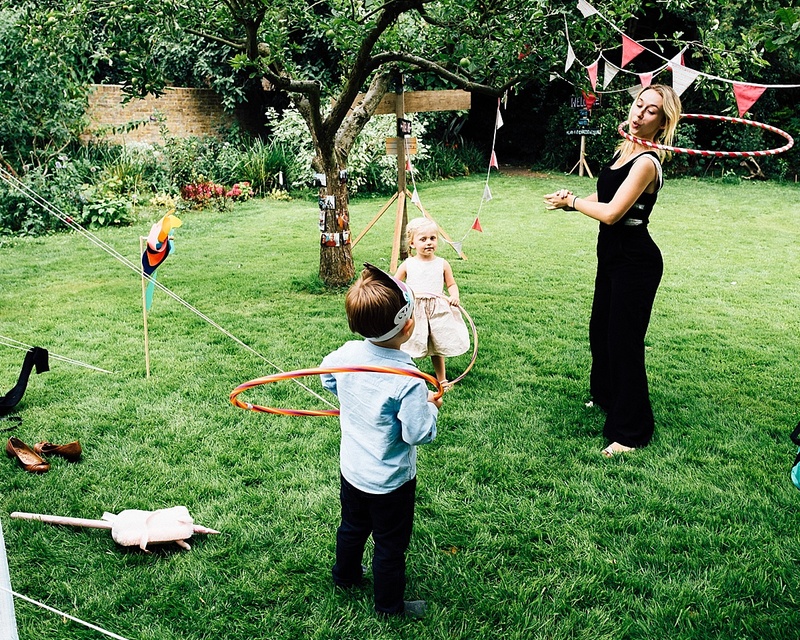 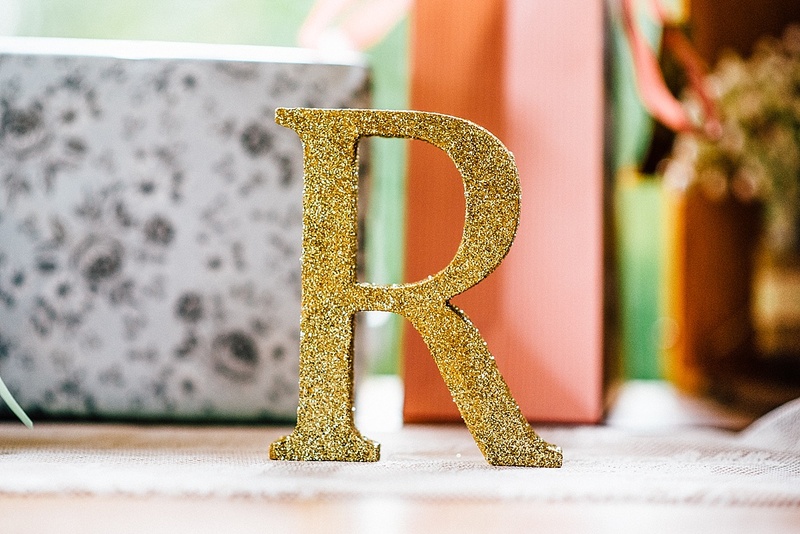 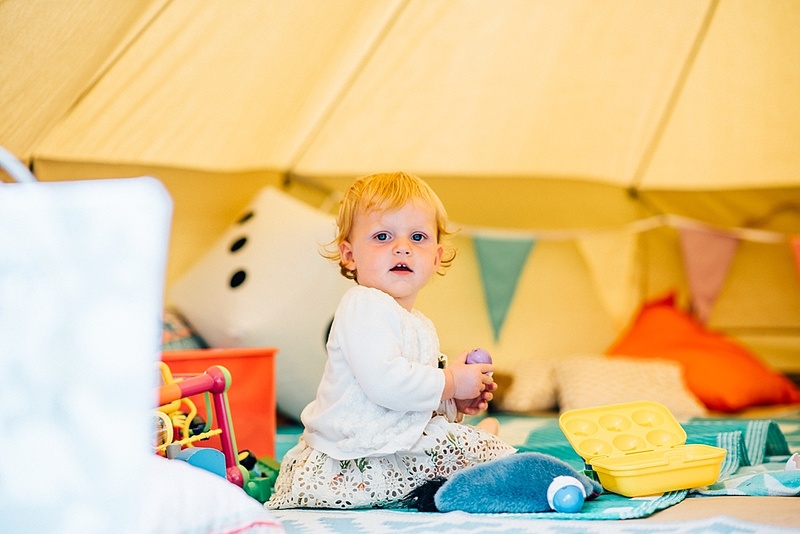 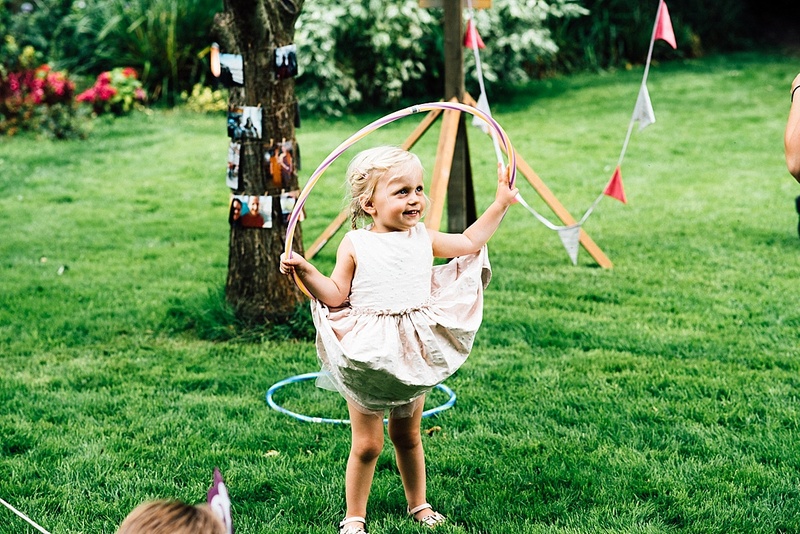 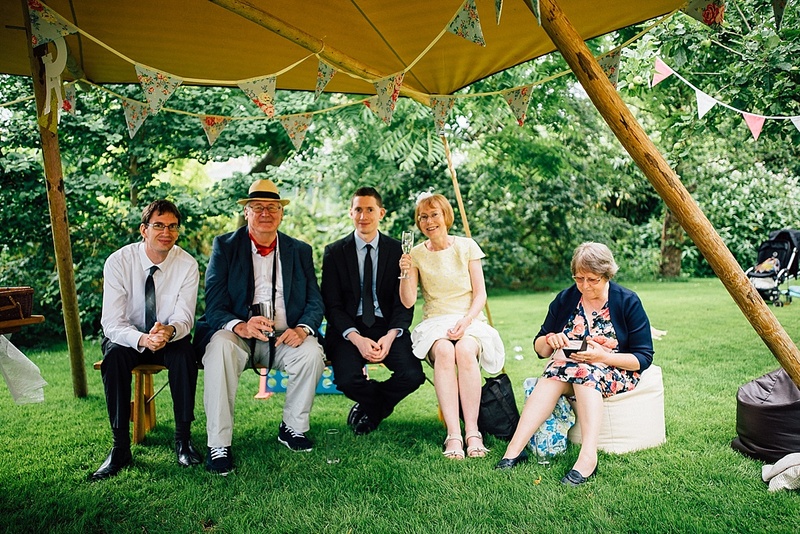 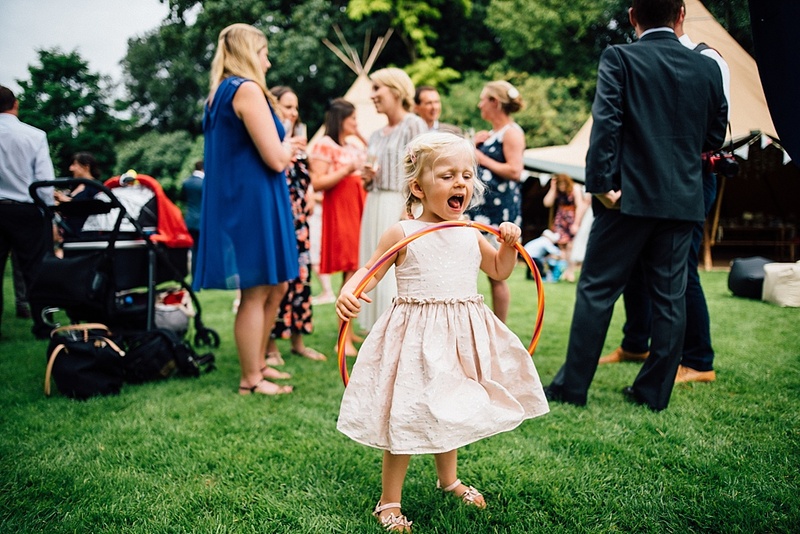 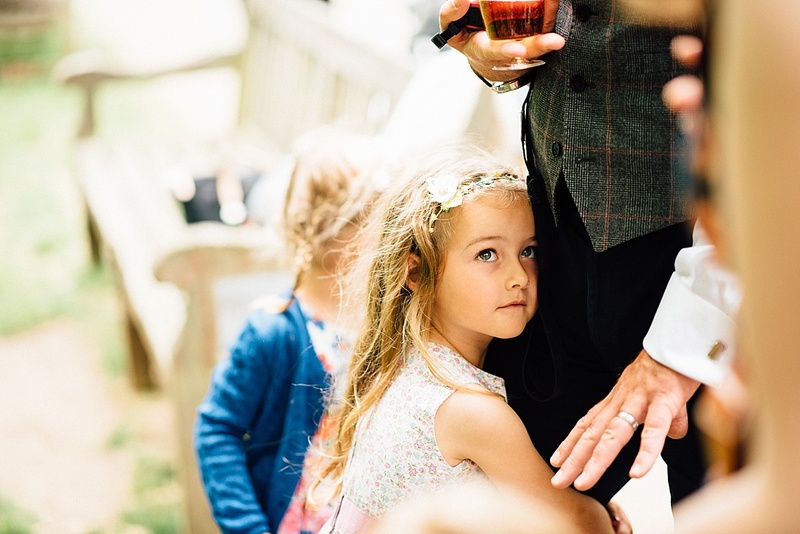 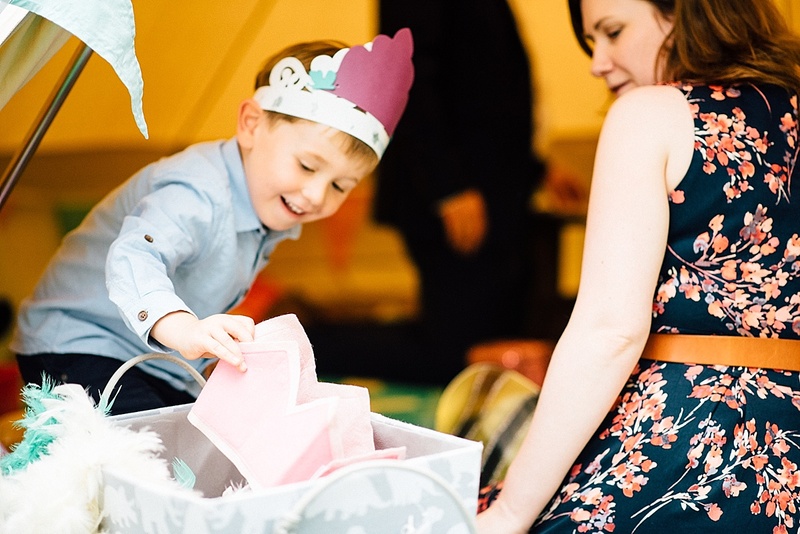 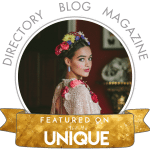 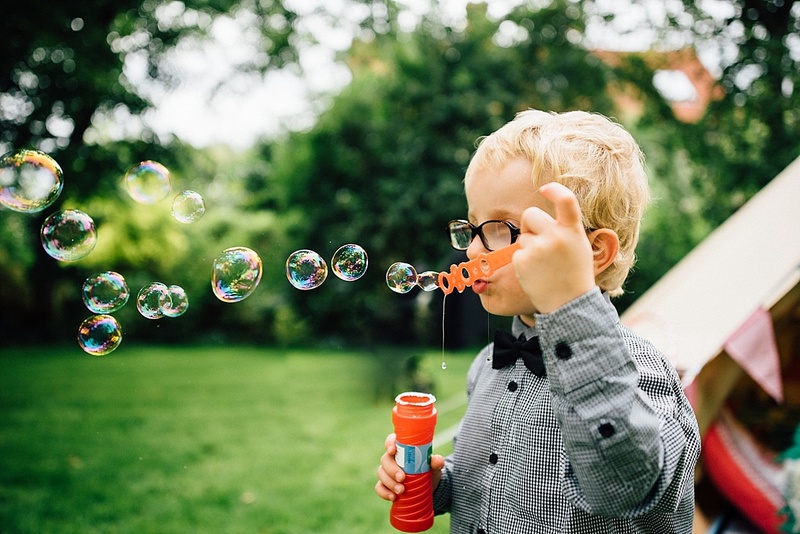 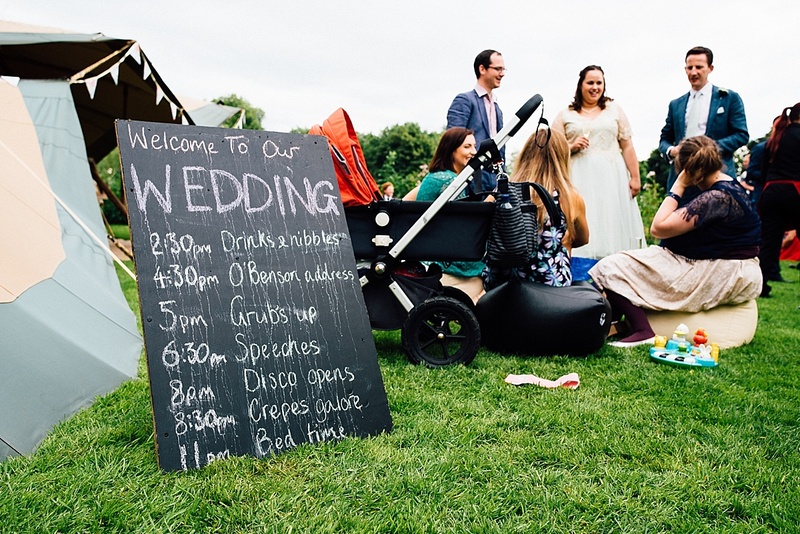 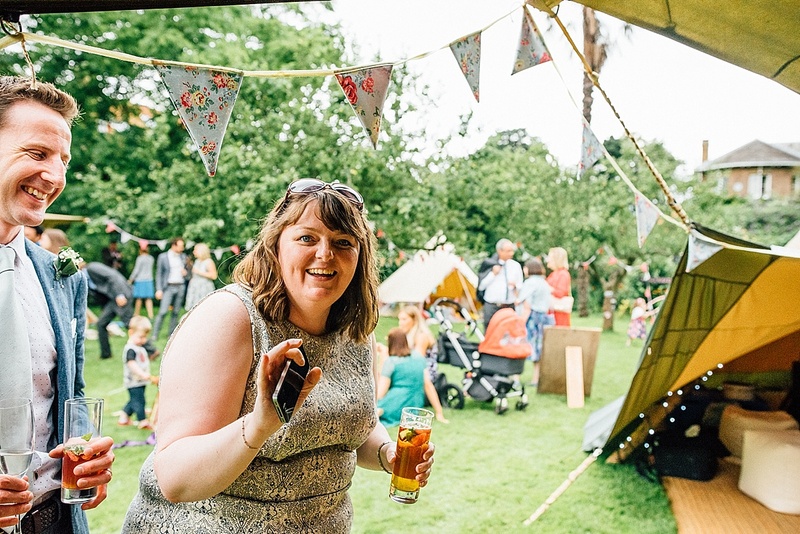 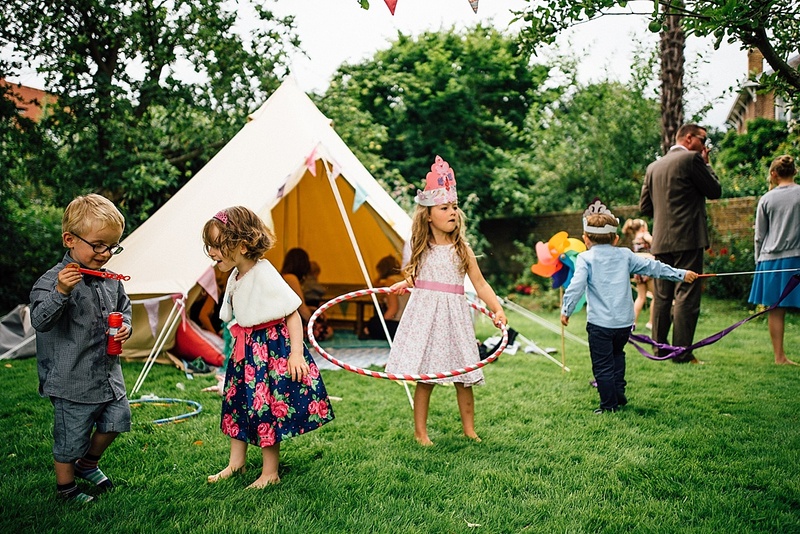 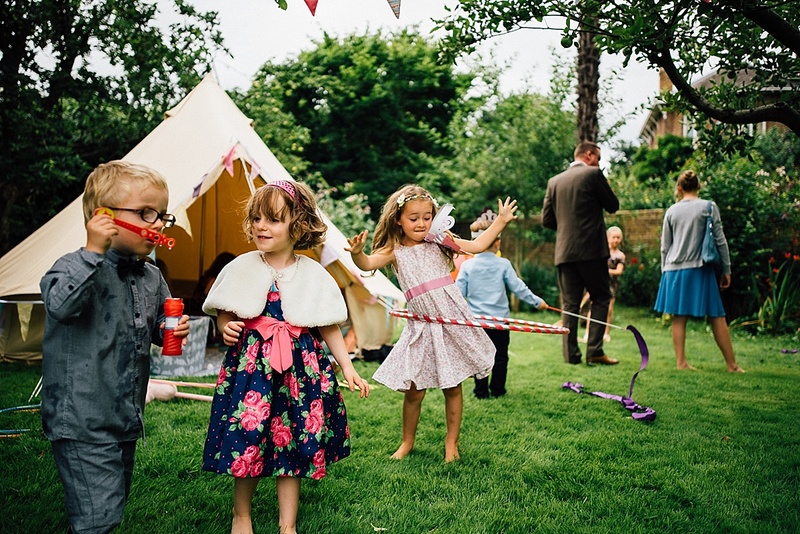 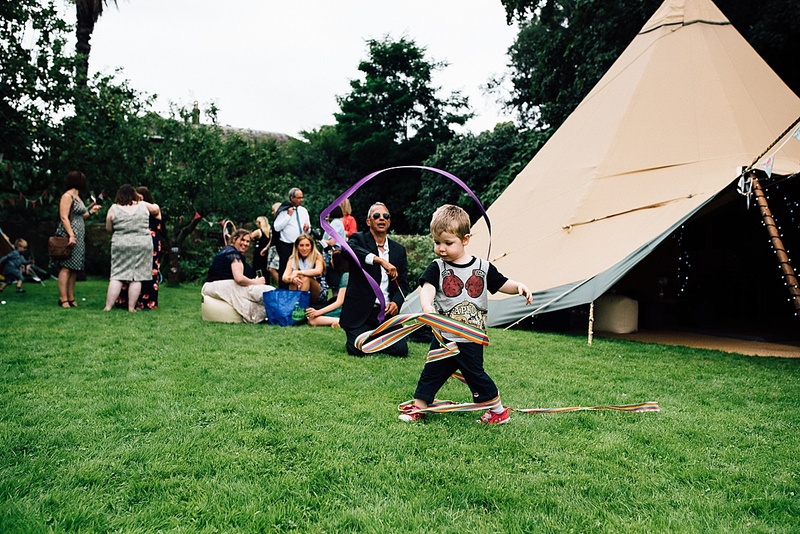 They thought about all their guests, especially the many youngsters and even hired children’s entertainer The Little Top– complete with their own tipi bursting with activities. 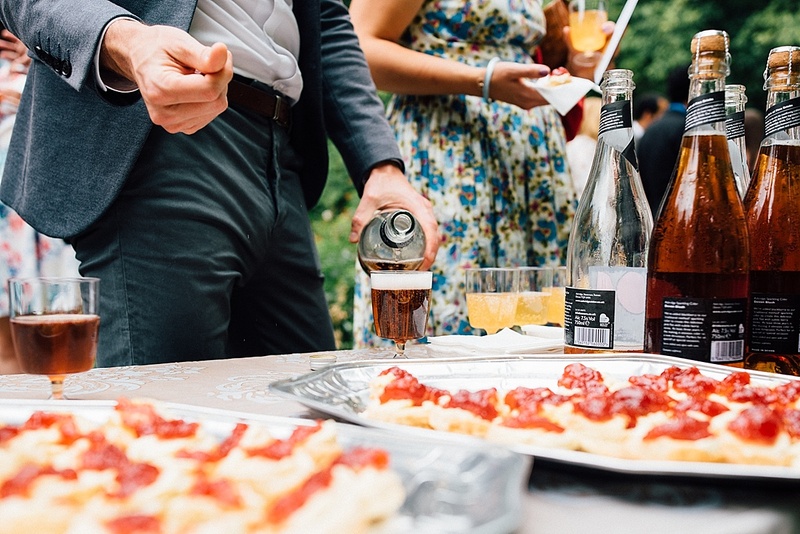 This made for a really fun wedding for all the guests. 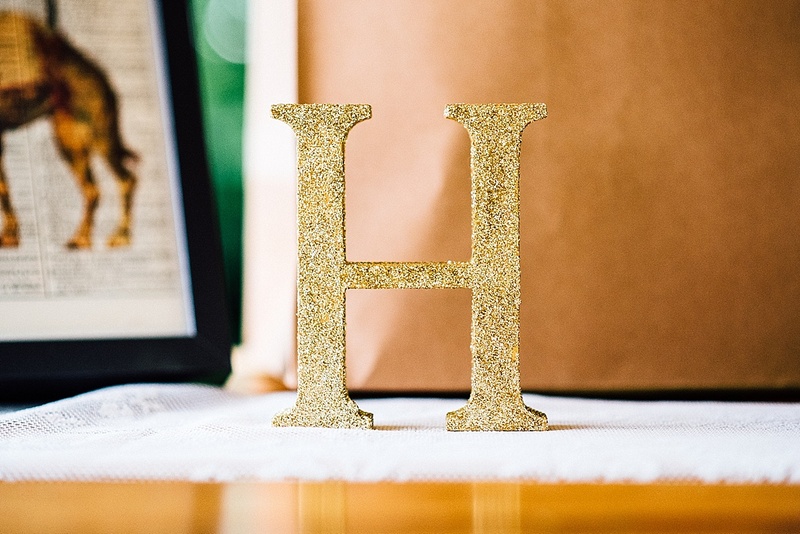 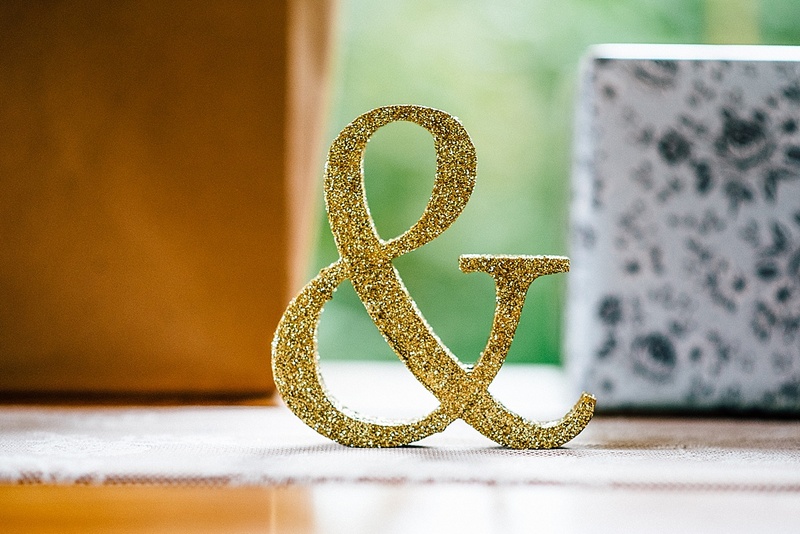 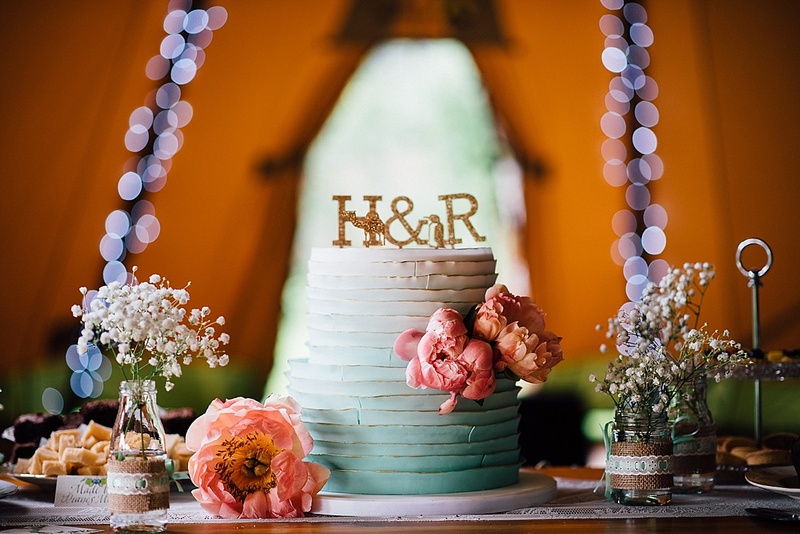 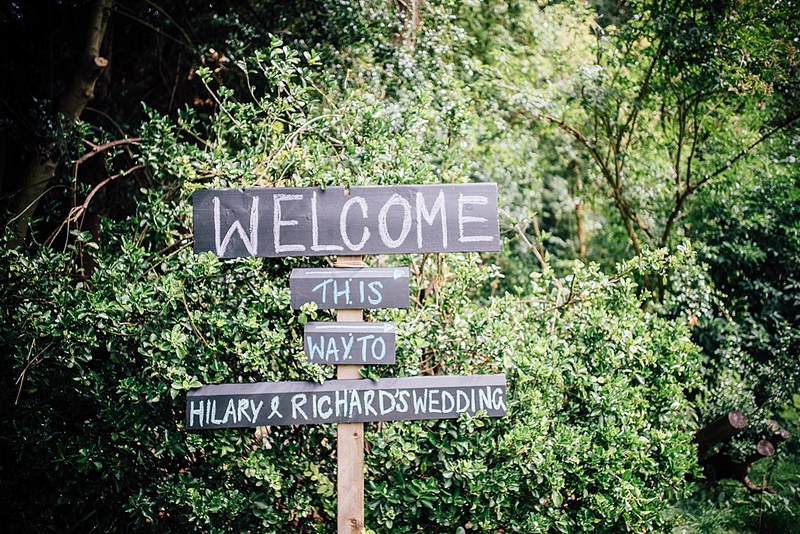 Lots of the details at Hilary and Richard’s wedding were homemade which gave their garden wedding a lovely personal touch. 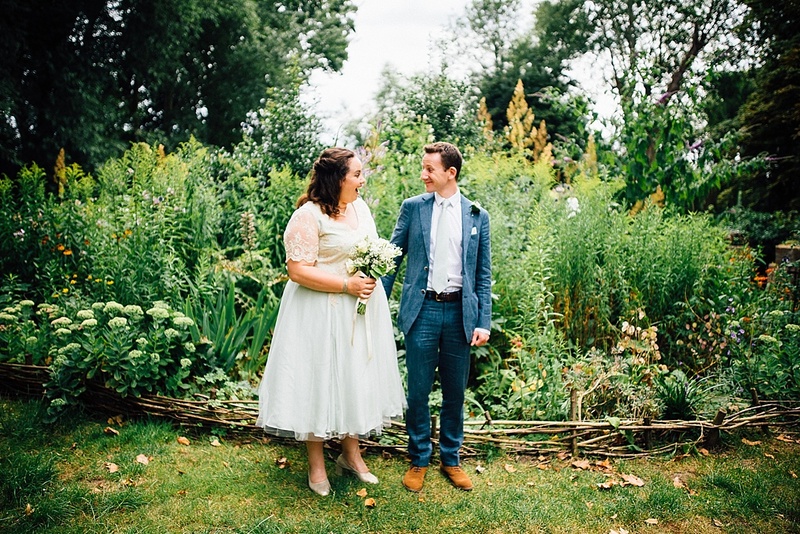 Hilary wore a mint green embroidered dress which had been kindly made for her by one of her mum’s friends. 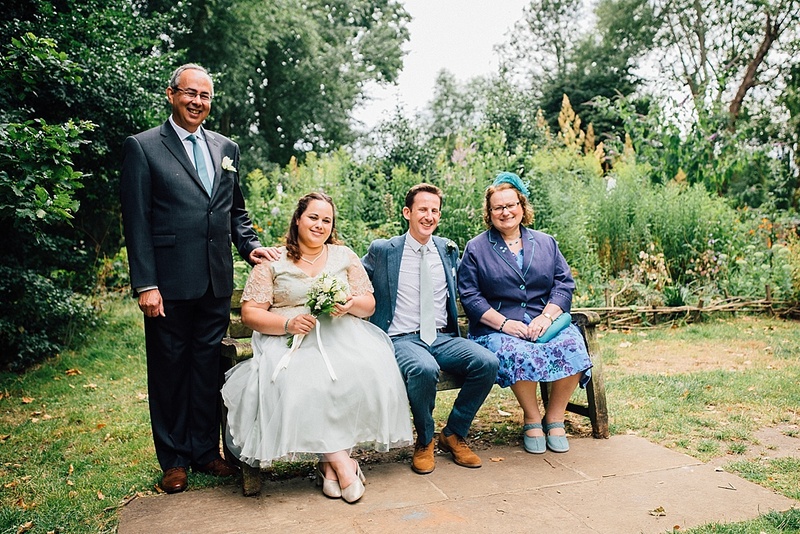 The bouquet was made up by Hilary’s mum combining a bought bouquet with flowers from the local florist. 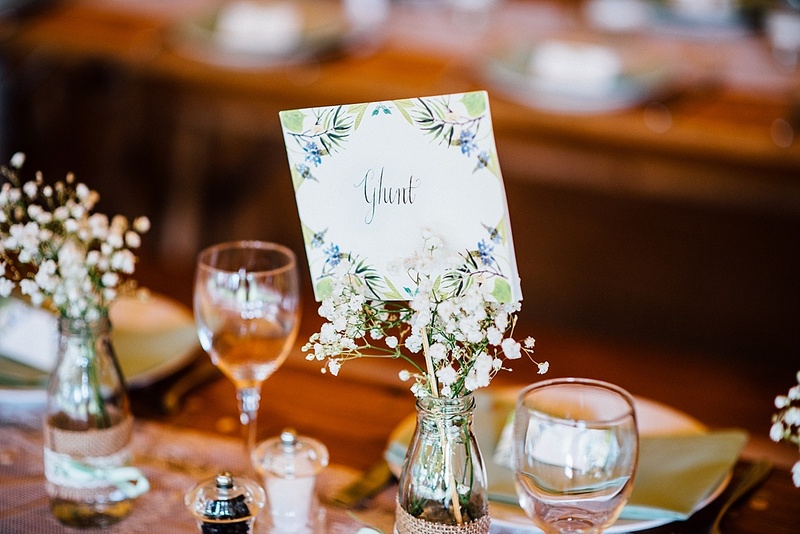 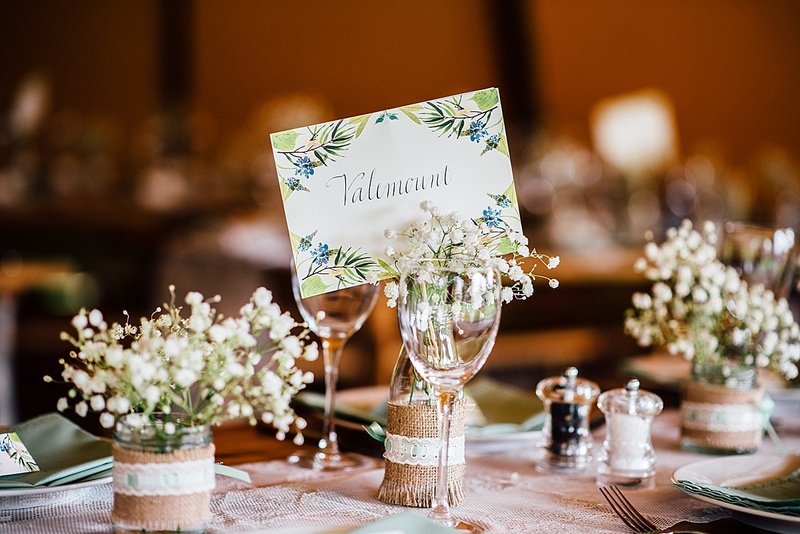 The table decorations comprised a table runner which was formerly a cheap pair of Ikea curtains, on which stood jars tied with lace and ribbon collected by the family, holding sprigs of Gypsophelia / babies breath which had been bought as a large bunch from the local florist. 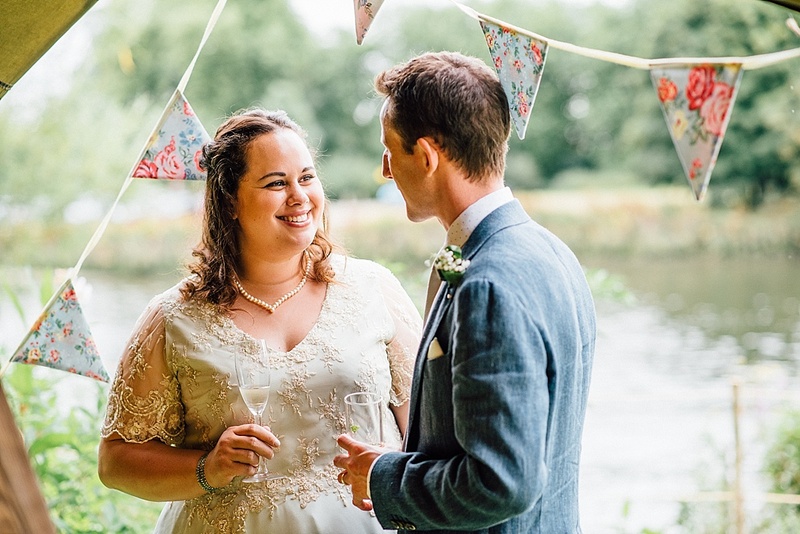 Richard made the tassel garland around the cake table which held the most epic wedding cake from Cakes by Robin, topped with the couples’ initials and a specially designed camel and penguin bought on Etsy from Miss Sarah Cakes. 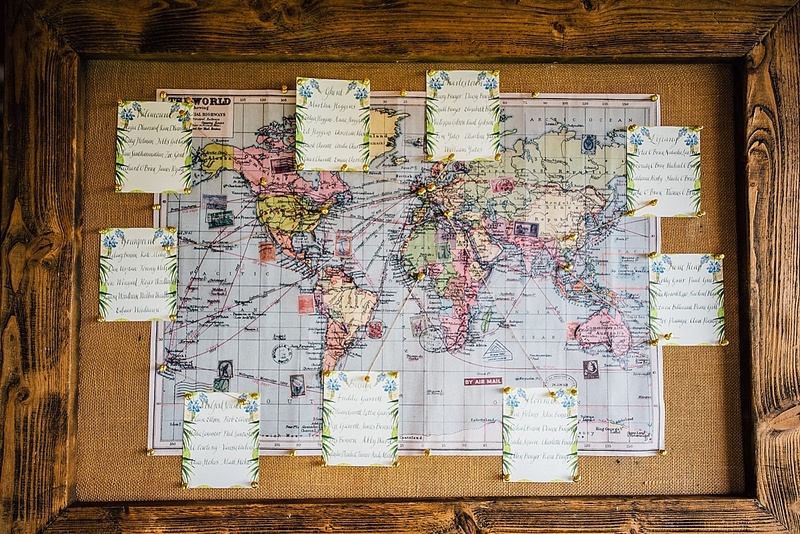 The table plan was laid out on a map of the world, printed by Papier and framed in a heavy wood frame provided by the tipi supplier. 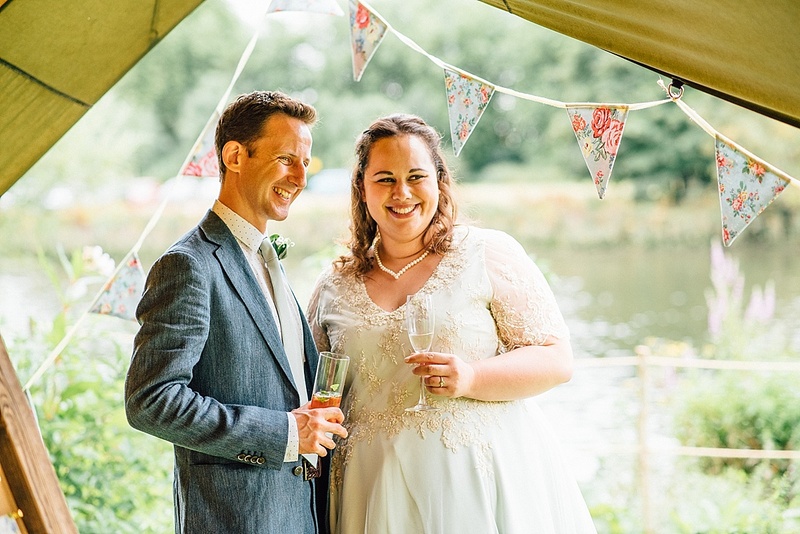 The couple’s love for travel was carried through to the dining area in the tipi by the hanging paper aeroplanes which had been patiently made by Hilary from an old road map. 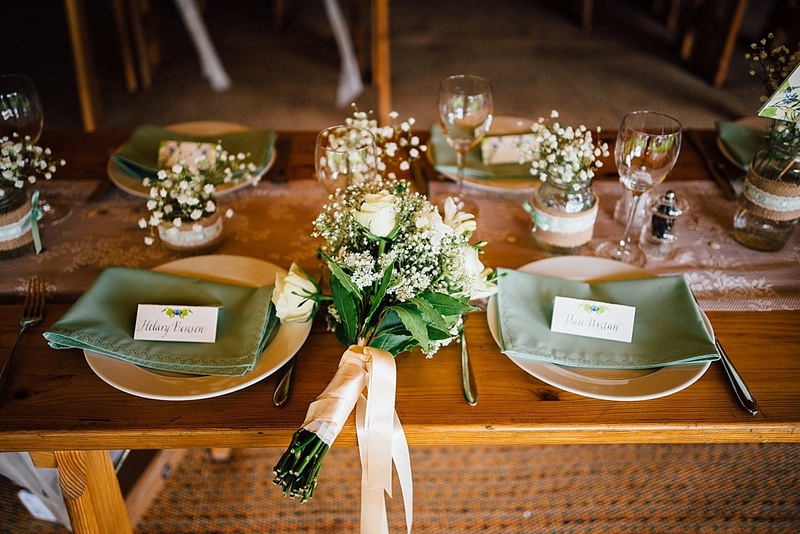 The table names and place names were also printed by Papier. 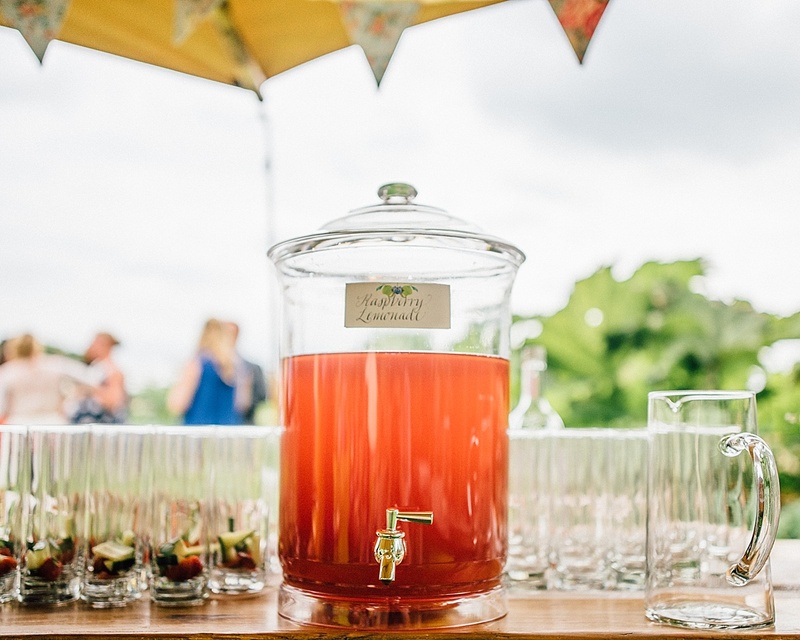 Thankfully, the sun was shining down for the guests to enjoy canapes, Pimms, Prosecco and raspberry lemonade in the beautiful garden. 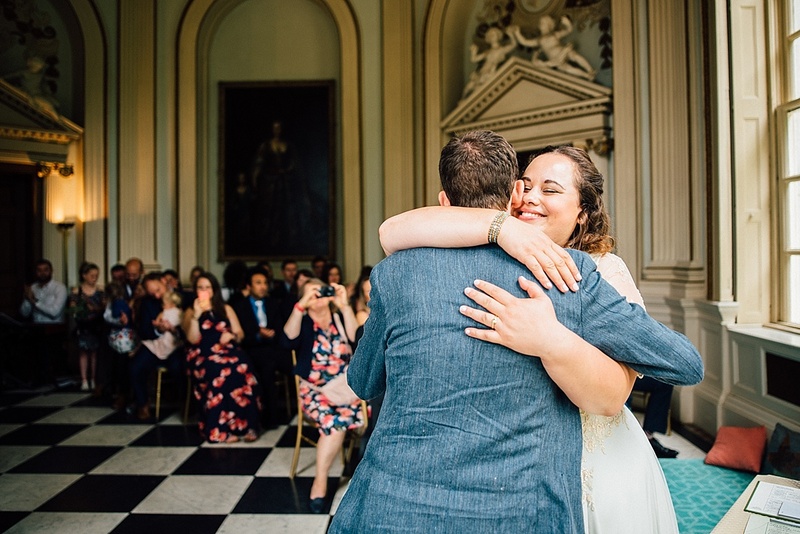 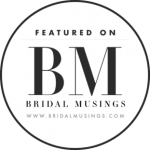 You can read what Hilary and Richard thought of my photos from their big day by reading their review of me on my nice words page.